Share the post "Album review: COLDSPELL – A New World Arise"
ColdSpell have been around since 2005 and this is the band’s fourth album, with what is quite a gap for them since 2013′s ‘Frozen Paradise’. However, that extra time in between albums has allowed the band to hone their sound and produce ‘A New World Arise’, quite possibly their best album to date. ColdSpell excel at riff-driven melodic hard rock, not dissimilar to Pretty Maids but with less keys. Songs like ‘Forevermore’ and ‘Call Of The Wild’ fair blast out of the speakers, each has a monster riff and memorable chorus. ‘Wait Until Tomorrow’ is another corker, mixing heaviness and melody in equal measure. Quieter moments come along in the shape of ‘Signs’, which builds nicely and shows off the singing of Niclas Svedentorp. Loving ‘Love Me Like You Do’, with what sounds like a banjo starting the song off in a country/bluegrass style, before the song morphs into a big tune that Whitesnake would do circa that band’s big hair years. Guitarist Michael Larsson is all over this one! 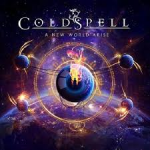 This entry was posted in ALBUM REVIEWS, ALBUM REVIEWS (Mobile), All Posts and tagged A New World Arise, album, Coldspell, hard rock, melodic, melodic hard rock, review, rock. Bookmark the permalink.